Standard delivery time for all ERIS reports is 5 business days unless otherwise specified below. Rush service is available at an additional charge: 2 business days +$120, 4 business days +$50. If 250m is not a sufficient search radius, a Custom report may be required. If a 250m radius is not sufficient, a Custom report may be required. For larger sites that do not fit within the standard 250m radius, a CUSTOM report will be required. The delivery timeline for this report is the next business day. While the report types listed above have a set 250m radius and a set number of databases searched, ERIS also offers clients the flexibility to build their own reports. Clients choose the search area, radius/buffer, and the number of databases to be searched for their project. Custom reports are generally required for large or irregularly shaped sites, pipelines, road/transit corridors, watersheds, new developments, golf courses, agricultural lots, and large industrial sites. Once the project requirements are determined, the client will be provided with a custom quote. A quotation may take 1–2 business days, and a $25 quote fee will be applied if the report is not purchased. The new RSC (Record of Site Condition) Report was designed to meet the requirements of the amended Brownfield Regulation 511/09. 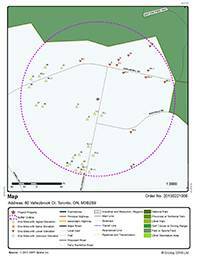 This report includes a search of all Ontario databases (federal, provincial and private) within a 300m buffer from the property boundaries of a subject site located within an urban or rural area. Also included in the report are 6 reference maps with their accompanying reports and metadata. The 6 maps are comprised of an ANSI (Area of Natural and Scientific Interest) map, a Bedrock Geology and Surficial Geology map, a Physiography map, an Ontario Base Map (OBM) and a Soil map. All maps conveniently locate your subject property as the centre point of a 2000m radius. The map legends and supplementary reports provide all the specifics needed to interpret the maps. For properties over 7 acres or corridors over 500m in length, select the RSC Report Quote option. A Stage 1 Preliminary Site Investigation (PSI) in British Columbia requires a review of historical records and specifically a mandatory review of contaminated Site Registry records at the subject site and adjacent sites. The BC Premium Report is designed to meet the requirements in the review of historical records for a PSI by searching all of ERIS’ Provincial and Federal environmental and historical databases out to 250m and the Site Registry out to 500m. This report will include all of the Detail Reports for each specific record found in the Site Registry up to 500m. A search of BC’s Site Registry is a requirement of any Stage 1 Preliminary Site Investigation (PSI) in British Columbia. ERIS’ BC Site Registry Report provides clients all of the Detail Reports for each specific record found in the Site Registry up to 500m. Designed to meet the revised Alberta Environmental Site Assessment regulations, as of March 1, 2016. The report searches all Alberta databases (federal, provincial and private) within a 300-metre buffer from the property boundaries of the subject site. Please note for properties over 7 acres or corridors over 500 metres in length, a custom quote/report is required. For more information, please contact your ERIS sales representative. 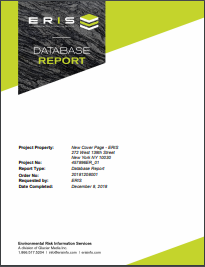 Designed specifically to meet the needs of our Quebec clientele, the RRE report searches the top 5 most consulted provincial databases from Quebec for a subject site and adjacent properties. Databases include: Contaminated Sites, Authorized Waste Disposal Sites, Hazardous Waste Disposal Sites, Petroleum Equipment Usage Permits and Water Wells. By allowing ERIS to do all the preliminary research, consultants save time and money. The report is delivered within 4 business days. Within the province of New Brunswick, a search for Property Based Environmental Information (PBEI) is an essential requirement when conducting Phase 1 ESAs. 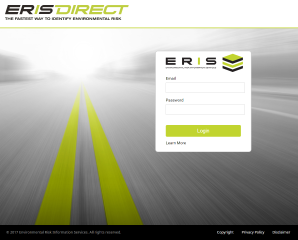 In an effort to continually provide high quality service and reports to our clients and enhance our one-stop-shop service, ERIS now includes the Property Based Environmental Information for a subject site under investigation on all New Brunswick Standard and Standard Select reports at no extra charge! ERIS Standard and Standard Select reports include a search of federal, provincial and/or private source databases for a subject site and adjacent properties within a 250m radius. Include New Brunswick PBEI at no extra charge! An Excel Add-On is an optional file you can order with your ERIS Report. They allow you the convenience of integrating database hits from your ERIS Report into your GIS platform and/or report and overlay it with other information pertaining to your project. Once your ERIS Report is complete you will receive an Excel file with the database hits within the search radius. The table will include the following fields: Database Source, Map Key, Company Name, Address, City, Postal Code, X Coordinate, and Y Coordinate. Xplorer is an add-on to ERIS products, including Database Reports, Topographic Maps, Aerials, the ON RSC Report and our new Physical Setting Report (if ordered). Xplorer allows you to quickly visualize and analyze environmental risk information related to a particular location, with built-in tools for analysis and customization. Overlay data and multiple images over current street layers. Accommodate Custom/Linear Reports for efficient review and analysis. View the transition of Aerial images through the decades using the Transition Tool. Calculate distance and area using the Measure Tool. Save views with your drawings, measurements, notations, and filters. ERIS Xplorer can be added to your order of any Database Report, Topographic Map, Aerials, ON RSC or Physical Setting Report (PSR) for an additional $40 on the Order Form, or as a bundle with the PSR for $100 with the purchase of a Standard Database Report; ask us about Xplorer pricing for a custom report. 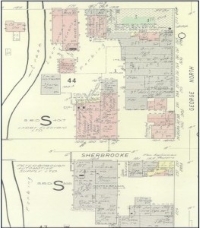 Fire Insurance Maps display streets and buildings of urban Canada in great detail. 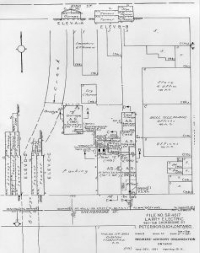 These maps illustrate building construction, occupancy and potential fire hazards tracing the historical development and providing detailed information of storage tanks, transformers, boilers and electrical rooms. The original maps were produced between 1875 and 1923 and updated until production ceased in 1974. There may be multiple maps available for the same location in some instances. The original fire insurance maps were produced by Chas. E. Goad Co. between 1875 and 1923. The research fee is applied once per address searched and applies to a full search for FIMs, Inspection Reports and Site Plans. ERIS offers digital topographic maps for all of Canada. 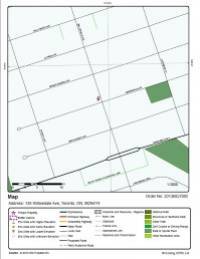 Maps are available at a scale of 1:50 000 and delivered within 5 business days. The maps include airports, buildings, contour lines, spot heights (elevations), hydrography, lakes, watercourses, hypsography, drainage, municipal boundaries, parks, pits and quarries, roads/streets, railways, utility lines, vegetation, wetlands, native reserves and the township boundaries as originally surveyed by the Crown. In Ontario, digital Base Maps are provided at a scale of 1:22 000. The ERIS City Directory Search provides detailed historic property-use information for the site property and surrounding area with nationwide coverage with information dating back to the late 1800’s. A city directory search is part of the mandatory records review section of the Canadian Standards Association (CSA) Z768 Phase 1 Environmental Site Assessment. Relevant information is researched for the site and surrounding properties in five-year intervals. All information is researched at the Library and Archives Canada in Ottawa. Digital — Digital aerial photographs are available in TIFF format. Laser Copy — Air Photographs are laser copied from contact print onto high gloss printer quality paper and have 10" x 10" dimensions. Turnaround times commence from date photo selections are made. Land Titles contain legal title information concerning property ownership, transfer details and any encumbrances such as mortgages or easements. Each time a new transaction occurs, property records are updated as soon as the instrument is registered. The information contained within a land title search does differ based on the province or territory. If a title search is requested for sites in provinces other than Ontario, clients will be contacted to confirm cost estimates and search requirements. Where available, registered property plans can also be ordered. 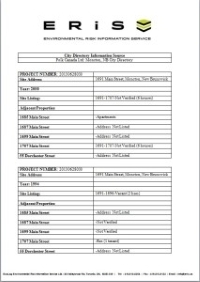 Property Underwriters Site Plans have been produced by the Insurers’ Advisory Organization for the past 100 years. These individual design drawings and field surveys identify the location, capacity, and contents of above and below-ground storage tanks, chemical storage, and other forms of environmental hazards. 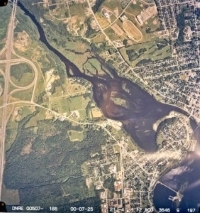 Property Based Environmental Information searches are unique to the province of New Brunswick and is an essential part of any Phase 1 ESA being conducted within the province. ERIS includes a free search for PBEI for the subject property under review for any Standard and/or Standard Select report ordered for New Brunswick. Requests are processed through the New Brunswick Department of the Environment and include a comprehensive search of following databases: Ministerial Orders or Remediation Orders, Petroleum Storage Tanks, Remedial Activity or Contamination, PCB Storage Sites and Landfill Sites. Results can take between 3-5 days to be delivered by email. Original copies are then mailed. The Alberta Environmental Law Centre will search their database for the environmental enforcement history of a company or individual, specifically reviewing enforcement action taken by the Environmental Regulatory Service of Alberta Environment under the Alberta Environmental Protection and Enhancement Act, and its predecessor legislation, the Hazardous Chemicals Act, Agriculture Chemicals Act, Clean Water Act and Clean Air Act to 1971 and/or pursuant to the Water Act from 1999 onwards. Information such as company/individual name, date of enforcement action, type of enforcement action taken, the amount of the penalty, the location and any comments regarding the enforcement action are provided. 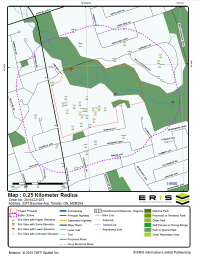 The ERIS PSR provides comprehensive information about the physical setting surrounding a site and includes a complete overview of topography as well as hydrologic, geologic and soil characteristics. The location and detailed attributes of oil and gas wells, water wells, public water systems and radon are also included for review. The PSR is also available for large/custom areas. The PSR can be added to your order of any Database Report for an additional $75 on the Order Form, or as a bundle with ERIS Xplorer for $100 with the purchase of a Standard Database Report; ask us about PSR pricing for a custom report. ERIS has collected over 7 million environmental and property-related records from various Provincial/Territorial, Federal and Private Sources to meet the needs of your property due diligence. Updates occur on a very frequent basis to ensure your reports include the most current information that is publicly available.